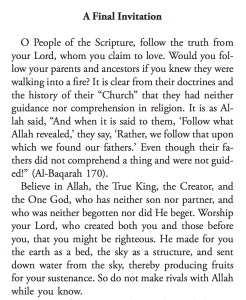 Dawah in Islam is not “proselytizing” to others. It is the “Call” or “Invitation” to Islam, and is a legal requirement before Muslims wage jihad against non-Muslims. The Koran speaks of Dawah – the Call to Islam. “We do not punish until We send a messenger.” (Koran 17:15). Tafsir Ibn Kathir, which legally defines every verse in the Koran, states this verse means Muslims cannot punish non-Muslims until they “give a warning” to them by inviting them to Islam. This is Dawah. First comes Dawah, then comes Jihad. Dawah is a legal requirement in Islam before Muslims can wage war on non-Muslims. This was a declaration of war. Do you think leaders at the Pentagon or National Security staffs were or are aware of the Islamic Law controlling this portion of the Law of Jihad for Muslims? This was a threat to these State Legislatures and remains in effect today. The perpetrator, Javid Kamal, was arrested in Texas on immigration related charges. He was not arrested because officials there understood the reality nor the magnitude of the threat that was being leveled at the state legislature. It is worth noting the latest ISIS publication of Dabiq offers “A Final Invitation” to Christians and Jews to accept Islam or face war from the Muslims. It is also worth noting that ISIS continues to accurately cite Islamic Sacred Law – which comes from the Koran and the example of the Prophet Mohammad – for their actions. ISIS quotes and promotes the same sharia that Muslim leaders in America like those from Hamas (doing business as CAIR) and the US Council of Muslim Organizations work so diligently to impose on non-Muslims. 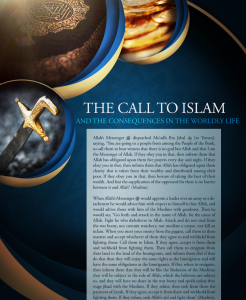 The Call to Islam – DAWAH – is the warning before the sword. Fighting back would be illegal. So I guess we wait and see what happens. So Dawah is Arabic for Death Threat. Aside from Islam’s extant multitude of megalomaniacal terrorist-psychopaths & embedded subversives, the only other existential enemy ever to gain even a tenuous foothold on the shores of this Judeo-Christian bastion of all-things-exceptional, I.e. to expressly threaten our lives & our freedoms, was a binary army of “Redcoats & Hessians” who came with the exact intent of every Sharia adherent Muslim presently here, and also under the flag of certifiable lunatics who sought our “submission” or otherwise kill us. What happened to them while they were here ended in the infliction of their ignominious defeat by American patriots at Yorktown, Virginia, thus expulsion from American soil. “I AM AFRAID ALL WE HAVE DONE IS AWAKEN A SLEEPING GIANT AND FILLED HIM WITH TERRIBLE RESOLVE”; (for I cannot imagine anything that might infuriate the Americans more than the surreptitious nature of what we have done [paraphrase]. I.e. No Pearl Harbor?, no Hiroshima; BEWARE!